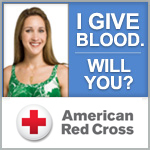 Remember 9/11 by donating blood! An American Red Cross Bus will be on hand to take donations! The need for blood is great. Donations are down. What better way to honor the men and women who lost their lives on 9/11 than to give the gift of life to others! Show your support and give blood! This entry was posted in Community on September 11, 2012 by Lynn Eades.